Today I am talking with Rebekkah Ford, author of the supernatural/paranormal novel Beyond The Eyes, the first book in the series. Rebekkah has an interesting background with the paranormal which she shares with us in her interview. I’ve been writing stories since I was a kid, and I’ve always been fascinated with the paranormal world. I don’t take things at face value, though. I’ve learned that from my dad when he did his paranormal investigations. I seek the truth in everything. If something is unexplained, yet there’s a possibility it can be true or exist, I keep an open mind about it. Can you tell us a little about your debut novel Beyond the Eyes? It’s basically about good versus evil, but it’s not linear. It’s packed full with everything: romance, love triangle, heartache, horror, friendship, humor, mystery and suspense. It also shows Paige having to deal with her emotional baggage that’s been weighing on her heart since her father died when she was four. But she has to in order to move onto the next phase in her life. When a ghostly voice whispers a haunting message to seventeen-year-old Paige Reed, her life takes a nightmarish turn, changing it forever. This book, along with the other two in this series throws light on some of life’s darker mysteries. Have you ever wondered why some people are vicious? Have you ever wondered if they had a soul? What if they were soulless and malevolent entities were able to possess them? Paige discovers the answers to those questions and more. Your parents investigated UFO sightings, ghost hauntings and Bigfoot sightings when you were growing up. How did their activities inspire your writing about the paranormal? The stories, experience, and mystery of the paranormal world is what inspires my writing. I’m fortunate enough to have grown up in that environment because my knowledge, experience and interest in the unknown is what aids me in my stories. It also fuels my imagination, which is great. Your job as a paranormal/supernatural writer is to scare the reader. Do you sometimes scare yourself when you're writing? Not really. I more or less trip out on it because sometimes I don’t know where the information I’m writing is coming from. And then I think about automatic writing, which is when a spiritual force is guiding your hand, using you as a tool to get her words down. Now that is kind of freaking. Do you have a "day" job? If so, when do you find time to write? Yes, I do have a day job, and I write every chance I get. I get up an hour early every morning and write, and then I write in the evenings and on the weekends. Beyond the Eyes is Book One in a series. When do you expect to publish Book Two? Probably at the beginning of 2013. Are you working on any other ideas for novels aside from this series? No, but I do have a character and an opening scene that keeps pestering me. I do plan on writing more books after this series. The next one will probably be a stand alone novel. What books and authors do you enjoy reading? 1984 by George Orwell. Interview With Vampire, The Vampire Lestat, Queen Of The Damned, and The Witching Hour by Anne Rice. The Stand by Stephen King. All of the Harry Potter books by JK Rowling. Shiver by Maggie Stiefvater and The Hunger Games by Suzanne Collins. Is there anything else you'd like to tell your readers? I just want to thank my readers for their support. There are no words that can convey how deeply I appreciate them. Paige is forced to dig deep into her father’s past and unearths shocking secrets about him and his bloodline. With the past and present colliding, Paige is only sure about two things in her life: she needs to outwit the dark spirits to stay alive, and she’s completely and helplessly in love with Nathan. Rebekkah Ford grew up in a family that dealt with the paranormal. Her parents' Charles and Geri Wilhelm were the Directors of the UFO Investigators League in Fairfield, Ohio, back in the 1970s. They also investigated ghost hauntings and Bigfoot sightings in addition to UFO's. Growing up in this type of environment and having the passion for writing is what drove Rebekkah at an early age to write stories dealing with the paranormal. At one point in her life, she thought she wanted to be a journalist, and although she enjoyed writing articles, she quickly discovered her real passion was writing fiction. 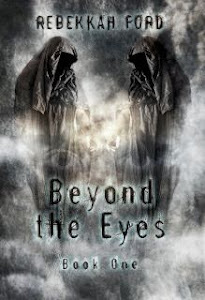 Her fascination with the paranormal is what led her to write the Beyond the Eyes series.